An incredible supply of fake art dents buyer thrill but Chinese paintings have crossed the US$23m mark for a single piece, The Last Supper, by Zeng Fanzhi. WHEN the international auction house Christie’s launched its new venture in mainland China, it did so with a bang. And a big bang at that. In a jam-packed church in downtown Shanghai September 2013, the world-renowned “explosion artist” Cai Guo-Qiang ignited a series of blasts at the edges of an eight-panel composition. Assembled VIPs held their ears as rapid-fire detonations sent smoke billowing through the hall. They waited expectantly as the air cleared, craning to see how gunpowder had transformed the ink drawing. The demonstration was in some ways reflective of the Chinese art market which in the last decade has undergone its own big bang and its own radical transformation; morphing from a sleepy backwater – a legacy of the Cultural Revolution when Red guards would regularly seize and destroy artworks – to a major player in the global art market. Since around 2003, a spree of art buying has taken China to the top of the world spending charts peaking in 2011 when it outstripped the US for the first time, grabbing 41.4 percent of global art auction revenue, according to Artprice, specialists in art market information. But at the start of 2014, with theAsian art auction season kicking off in March, observers say the boom-time sentiment that has gripped the market for much of decade has faded. A sharp retrenchment in 2012 sales shook investor confidence. And even if 2013 sales proved the market is still luring buyers – London-based ArtTactic reports Chinese art auction sales are up 28 percent in 2013 from the previous year’s slump – it’s clear that for most of the market caution rules the day. The standout is China’s contemporary sector where staggering sales continue to whip up excitement and worry in equal measure. Keverne, calls it a “double-edged sword,” noting that not only are buyers “taking a more conservative approach,” but supply has dwindled as well with few high-end collectors looking to sell. Even Christie’s which saw a hefty jump in worldwide sales in 2013 – in no small part thanks to a crop of Chinese billionaires – paints a more subdued picture for classical Chinese art and antiquities. “By 2012, the Chinese market had grown so phenomenally quickly that sustaining such a fantastically quick growth was unrealistic,” says Hong-Kong based Jonathan Stone, the auction house’s International Head of Asian Art, noting that the buying binge for traditional art has tempered to a more “sustainable” level. The numbers bear out this more cautious tone. A study released in January by the China Association of Auctioneers (CAA) and New York-based Artnet, a firm that tracks auctions, reveals that globally auction sales of Chinese art fell 37 percent from 2011 to US$6.9 billion in 2012. The Artnet-CAA report said the high end of China's art market took the hardest hit. Specifically, 409 Chinese works, mostly traditional paintings or calligraphy, sold for more than US$1.5 million around the world in 2012, down sharply from the 831 works sold at that price level in 2011. Similarly, a report by Dr Clare McAndrew for the European Fine Art Foundation (TEFAF) points to a steep drop in Chinese auction sales from 2011 to 2013. “Auctions have been the main engine of growth and heavily dominate the market, accounting for close to 70 percent of sales in China. From 2009 to 2011, sales values in the sector increased by over 350 percent, but declined 30 percent to €6.9 billion (US$11.3 billion) in 2012 in the Chinese art market from 2011 to 2013," the report reads. China’s economy is partly to blame: while it grew at 7.7 percent in 2013 this doesn’t compare to the full-throttle double-digit rates chalked up over the last few decades. But collector confidence has been has been spooked as well by tales of payment defaults, forgery and market fraud. A recent series in The New York Times chronicled the problems plaguing the Chinese art market, including forgery. The paper notes that, “The trail of phony antiques, bogus paintings and fake bronzes winds throughout China these days” and cites a study by the art data company Artron that estimates as many as 250,000 people in some 20 Chinese cities are involved in producing and selling fakes. The town of Jingdezhen in southeastern China stands out. Once at the centre of high-fire porcelain making, a sophisticated art form perfected during the Ming (AD 1368-1644) dynasty, the town now churns out copies by the thousands in over 100 factories that dot the grim industrial landscape. Some of the pieces end up – intentionally or through a convoluted series of sales and re-sales – in the hands of major collectors, auction houses and museums. Typically, Chinese collectors look for art that reflects their culture, with demand for traditional Chinese pieces particularly strong even among younger buyers. The dark side of this is a surge in forgeries hitting the market. “We see alot of young faces in our part of the market, which is traditional works of Chinese art and ceramics,” notes Hyman at Bonhams. “Even though there have been many, many, centuries of collecting traditional Chinese art in China, there was a period in the 20th century when it was nearly impossible. So in many ways the Chinese are rediscovering or repatriating their art,” he says in interview at the London headquarters. He acknowledges that traditional art and antiquities are more likely to be faked than contemporary works where the artist is still alive to judge the piece’s authenticity. Sarina Tang, a Shanghai-born art collector and curator, argues that the plethora of fakes is complicated by a cultural acceptance of copying old masters, viewed more as admiring imitations than unscrupulous forgeries. “One way in which Chinese artists learned how to paint was to copy old masters. It wasn’t ever considered a crime or a terrible cultural breach as it is in western culture,” says Tang from her New York office where she runs Currents, a foundation promoting Chinese art and music internationally. Increasingly, high-profile Chinese forgery scandals are grabbing the headlines, sending shudders through the art market and dampening collectors’ enthusiasm for buying. In September 2013, Sotheby’s put the work Gong Fu Tie up for auction. Neither international auction house Sotheby’s nor Christie’s are allowed to sell ancient Chinese paintings or art works that are defined as cultural relics in mainland China. So when they auction such works it is typically done in New York, London or Hong Kong. Gong Fu Tie went on sale in New York with the auctioneers expecting a sale at around US$500,000. But fierce bidding boosted the price to US$8.2 million where it was acquired by a wealthy Shanghai businessman and collector. The 1,000-year-old masterpiece of Chinese calligraphy was the work of Song Dynasty poet Su Shi. At least that’s what Sotheby’s believed. But since the thrilling bidding war in New York took place, the work has been declared a fake by three Chinese art historians. Sotheby’s remains adamant that the work is real. Sotheby’s Head of Classical Chinese Paintings, Rongde Zhang, declined to discuss charges that the piece was fake and in an email commented only that, “Our sale in the fall of 2013 was a huge success” with the ‘Gong Fu Tie’ calligraphy at the heart of it. “The calligraphy is an extremely rare find,” he wrote. But it was last July when the Jibaozhai Museum in Hebei province was shut down setting tongues wagging in the international community and making Chinese officials squirm with embarrassment. Some 40,000 pieces – nearly everything in the museum – were suspected of being fakes, including a five-colour porcelain vase from the Tang dynasty. In the case of the vase, the artistic technique wasn’t even invented until hundreds of years later. China’s Association of Auctioneers and the Chinese government and have tried to crack down on forgeries, but the fast-growing auction market has proved tough to tame. The problem is exacerbated by an explosion in the number of auction houses, according to Art Price. Ten years ago, just five auction houses exceeded turnovers of around US$8 million in London and New York. Today, there are 31 operating at this level, 70 percent of them are in Asia. Indeed, China’s Poly Auction has taken the title of third largest auction house in the world behind Christie’s and Sotheby’s with 2012 sales reportedly near US$1 billion. Poly has refused in recent years to allow the China Association of Auctioneers to publish data on sales of pieces which have not been paid for completely. Further, the association’s studies found that in 2012 only 34 percent of sales Poly reported for works valued at over US$1.6 million were actually completed by the following year. Indeed, details about the sales performance of China's auction houses have been tough to uncover since the art market boom began. Some of the country’s top auction houses refuse to talk about artworks sold at record prices, knowing they were never paid for once the gavel went down. Winning bidders simply refuse to pay, fearing the piece was forged. The country’s forgery problem helps account for the mounting number of payment defaults plaguing Chinese auction houses. A study by the China Association of Auctioneers found that about half the sales of artworks valued at over US$1.5 million were never completed because the buyer failed to pay what was owed. Observers say it’s reached the point that when the gavel falls on an item in a Chinese auction house, it’s seen as only the starting point for negotiations over the final price to be paid. If there is one sector of the art market that is relatively shielded from forgery problems, it’s contemporary art. The reasoning is obvious: with the artist alive, authentication is simply a matter of contacting the studio. And with Post War and Contemporary Art accounting for a full 43 percent of market share by value, consumer confidence in the sector can turn the market’s fortunes one way or another. It may be no coincidence this was the one segment of the Chinese art market that boosted a bumper year 2013. According to the art market research firm ArtTactic, auction sales soared by 69 percent from 2012 to 2013 and with it a surge in buyer confidence. The lion’s share of Chinese contemporary art buyers are still locals. Among them are a handful of established buyers who are putting their time and a hefty amount of cash into building up their own collection with an eye toward showing them in private museums, such as in the Long Museum in Shanghai. At the same time, the market is becoming increasingly international with collectors outside Asia keen to buy young Chinese contemporary artists. Some collectors such as Americans Don and Mera Rubellhave used their entire museum space in Miami to showcase 28 Chinese contemporary artists. In Europe, collectors Dominique and Sylvain Levy, continue to build on their existing collection, already 200 artists strong. “Chinese artists want to be recognised outside China,” Sylvain Levy recently told an audience of the International Symposium for Gallerists. But a slew of museum exhibitions isn’t necessarily on their agenda, commanding gallery space is what’s driving China’s contemporary artists, Levy added. He points to the top grossing Chinese artist Zeng Fanzhi as an example. 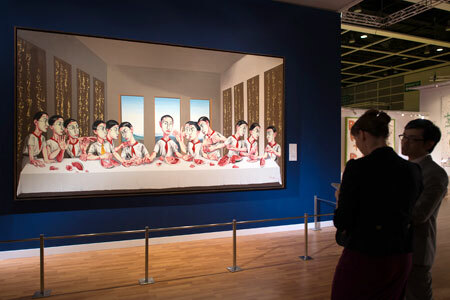 In October 2013, the artist, who is not yet 50 years old, sold his painting The Last Supper to a non-Chinese collector for US$23.3 million at auction in Hong Kong – a new record price for a work by an Asian contemporary artist. “What is interesting is that Zeng Fanzhi has not had very important exhibitions in museums. There is no validation coming from museums…because the art system in China is not established, people don’t [rely on] museums to confirm the validity of an artist, they believe the market,” Levy says. The Hua Gallery, a 2,000-foot space on south bank of the Thames, is an alluring space for Chinese contemporary artists eager to exhibit in London. On a recent visit, the Beijing-based artist Han Bing’s photographs covered the white walls. In one, scraps of garbage float aimlessly over a concrete high-rise; crushed plastic bottles and soiled cardboard drift in the oil-stained sky. The detritus of modern living photographed in the reflections of a sewage ditch. Bold, powerful and provocative, they would never have seen a gallery wall before 2000. “After Tiananmen Square and into the 90s, the restrictions on art and artists were severe. Since 2000, Chinese authorities have realised the importance of supporting art, they understand its value as a commodity and a propaganda tool; Look at all these amazing artists we have here,” says Dagmar Carnevale Lavezzoli, the gallery manager. At the same time, Carnevale adds, a whole generation of young artists have moved on from the political realism phase to more “introspective even psychological themes.”Still, artists in China need to walk a fine line, knowing how far to push and when to retreat. Politically and socially committed artists such as Zhen and Qiang Gao and Ai Weiwei have the fame and international clout to test the boundaries, but even they can only push so far. It’s still uncertain if the Chinese contemporary market is a speculative bubble ready to bust or at a turning point in which the world’s collectors are shifting their gaze eastward. What is certain is that the talent pool in China is huge, but for the market to mature and thrive it needs to see beyond the top 20 big namesthat have grabbed the spotlight for over a decade. There is a new crop of young Chinese artists out there and they’re clamouring for attention. Caitlin Randall is a London-based freelance journalist and a visiting lecturer in journalism and nonfiction writing at Roehampton University. Sheâ€™s written for The Wall Street Journal, Art& Antiques Magazine, Newsday and The Miami Herald, among other publications. She has also been a correspondent for Reuters in London and Madrid. Not surprising. The Chinese are buying everything they can lay their hands on. A very good read. The Last Supper sale price is phenomenal and the issue of fakes deserves an article on its own.